One side of my family were the Parsons and the Knight family from Oxfordshire, on my mothers side were the Butler family from Berkshire. My Nan is Ruth Butler, whose parents were Frank and Edith. The Butler family tree starts off at Aldins farm, Blewbury and then on to Upton and Peasemore and then on to Elderfield in Chilton, near Didcot. 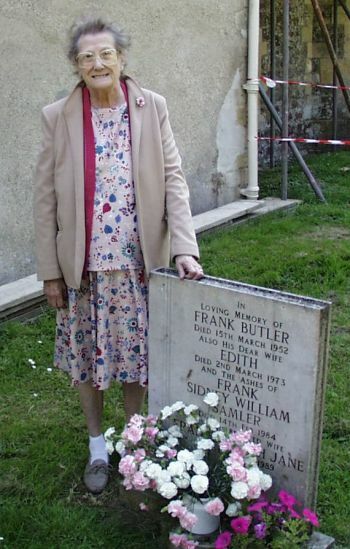 Ruth Butler at the side of her parents and sister Frances grave in Chilton on 22/7/2000. Also buried here is her first husband, Leslie Shaw and her sister May Butler who died of TB back in the 1930's - Both are buried in unmarked graves. Frank Butlers brother, Henry John is also buried here with his wife Sarah Ann. For generations the Butler family have been Farmers, Carters, Ploughmen and Laborers and my Nans childhood was full of memories of work in the fields stacking hay and corn. On Sundays the family had a day of rest which was spent at Sunday School and then onto Church. In early evenings during the week Ruth and Edith would walk the 5 miles into Didcot to the pictures and Frank would meet them on the way back. Ruth's first job was cleaning and bed making for a lady in the village of Blewbury where she remembers the Water cress growing in the pond at the bottom, which was picked and eaten for salads. For many years after Ruth worked for Mr. Roland at the Bakehouse in Upton where they would bake bread and cakes and would deliver them in a cart. There were no motor vehicles on the roads back then. During the war Edith Butler used to do the washing for many men stationed at nearby Harwell in the RAF. Ruth had to place each set of washed and ironed clothes in a small bundle and sometimes for a joke she would sow up the arm and leg holes - The RAF found this prank highly amusing! There was an old lady in Upton who used to carry an old lantern around down the old lane at night, against the warnings of lights out as they were in a primary bombing area. One night the village was indeed bombed and it is widely thought that it was entirely her fault! One time during World War Two Ruth was out walking in a field with her newly born baby (my mother Christina) at Chilton. Her family were at work in the field when a German plane shot over the horizon. Ruth quickly pushed the pram (then coloured green for camouflage) over to a large old Oak tree and ran for cover. As the plane shot over it started shooting, closely missing Ruth's parents and Gran out in the field. The plane turned round and came back but luckily the machine gun by then had jammed. Ruth remembers the plane coming down so low that they could have touched the fuselage and wings!! In 1954 the family moved from Chilton to the Oxfordshire village of Enstone where they lived in an old haunted farmhouse next to the Litchfield Arms public house.